The US has been given 90 days to drop a special tax exemption for the giant aerospace company Boeing because it amounts to an unlawful subsidy. "The Panel has found that the European Union has demonstrated that the B&O aerospace tax rate for the manufacturing or sale of commercial airplanes under the 777X programme... is a subsidy contingent upon the use of domestic over imported goods [and is] prohibited," said the WTO in its ruling. "Accordingly, taking into account the nature of the prohibited subsidy found in this dispute, the Panel recommends that the United States withdraw it without delay and within 90 days," it added. 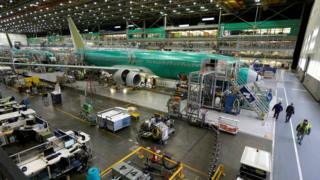 Boeing downplayed the impact of the WTO ruling against it. "In total, the EU claimed that Boeing had received $8.7bn in subsidies. This claim was rejected by the WTO, which found future incentives totalling no more than $50 million a year to be impermissible," Boeing said. The aerospace company added: "The WTO found that to date Boeing has received no benefit from the 777X (tax) rate incentive, and will not until 2020, because the first airplane will not be delivered until then." However the EU Trade Commissioner, Cecilia Malmstrom, adopted a different interpretation of the WTO ruling. "The panel has found that the additional massive subsidies of $5.7bn provided by Washington state to Boeing are strictly illegal," she said. "We expect the US to respect the rules, uphold fair competition and withdraw these subsidies without any delay". Tom Enders, chief executive of Boeing's big rival Airbus, which in September was on the receiving end of a similar WTO ruling about EU subsidies - a complaint initiated by Boeing - held out an olive branch. "I continue to think that the only way out of the ridiculous series of disputes initiated by the US is to agree on a set of globally applicable rules for the support of the civil aircraft industry, which would benefit both sides of the Atlantic," he said. Either side in the Boeing subsidy dispute - the EU or the US - can appeal against the WTO ruling.